The Mississauga Chiefs first changed to the Mississauga Ice Bears, and now are called the Oakville Ice. Their new web site can be found at www.oakvilleice.net. The Mississauga Chiefs Senior AAA women's hockey team represents the highest level of female hockey in Canada. 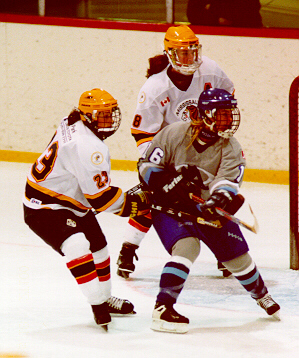 Eight players from the NWHL represented Canada at the 1998 Winter Olympics in Nagano, Japan. Many NWHL players have represented Team Canada, Team USA, Team Switzerland, and Team Finland at past World Championships. The Chiefs were provincial champions in 1994, representing Ontario at the Canadian National Championship, and hope to do the same again this year! The Chiefs are a member of the Mississauga Girls' Hockey League (MGHL), and in addition to serving as role models for younger players, the members of the Chiefs actively assist in their hockey development as part of a community outreach program. This season, the Chiefs' home games will be played on Wednesday nights, from 7:30 to 9:30 p.m., at the Hershey Centre on Rose Cherry Place, just off Matheson Blvd. and east of Kennedy Road in Mississauga. They will also play a few Saturday night home games against teams from out of town. These games will take place from 12:00 to 2:00 p.m., at smaller ice surface in the Hershey Centre. The team consists of 20 players, three coaches, a trainer, and 13 off-ice staff. All players and team staff volunteer their time. None receive any remuneration. The team will play approximately 60 games, 20 of which are NWHL home games. Each senior AAA game takes two hours to complete, including the floods between each period. The before and during game program consists of NHL-style music, the national anthem, 50-50 draws, and special theme nights. Several games are broadcast on Rogers Cable TV. This page has been visited times since September 1997. © Copyright 1997 Andria Hunter. All Rights Reserved.